Over the past eight years, the G20 has emerged as one of the most prominent political fora for international cooperation. For transnational corporations and their national and international associations and lobby groups, the G20 process provides important opportunities to engage with the world’s most powerful governments, shape their discourse, and influence their decisions. 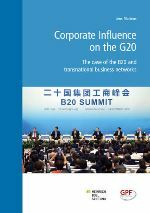 For this purpose, business actors have created a broad network of alliances and fora around the G20, with the Business20 (B20) as the most visible symbol of corporate engagement. A new working paper published by Global Policy Forum and Heinrich-Böll-Stiftung maps out the key business players and associations from the different sectors and branches involved in the work of the G20, and analyzes their core messages and policy recommendations. Business groups are constantly preaching economic growth as a panacea and a sine qua non condition for prosperity, ignoring more sophisticated concepts of sustainability; they urge the G20 to “optimize” and “re-evaluate” regulations intended to lessen the risk of another global financial crisis; they call on governments to strengthen investment protection and promotion agreements that de facto give priority to investors’ rights over human rights and the environment; they promote PPPs that minimize the risk for the private investor at the expense of the public partner; and they push for preferential treatment for the business lobby in global governance. In order to at least gradually overcome the bias towards corporate interests in G20 policies and the double standards in its openness towards business and civil society, substantial reforms are necessary. The working paper spells out a few measures that are indispensable to counteracting corporate influence on discourse and policies in the G20.